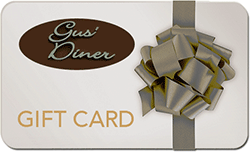 Have Thanksgiving Dinner with the Gus’ Diner family. Details coming soon. Have Christmas Dinner with the Gus’ Diner family. Details coming soon.